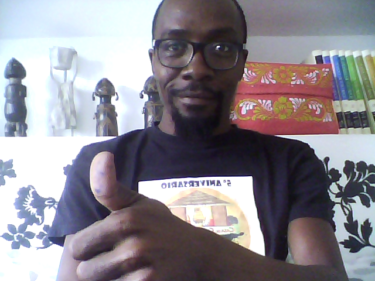 Musa Kart is profiled in this video produced by Duco, True Heroes Films, for the Swiss Foundation Cartooning for Peace, which awarded Musa his international prize on May 3 in Geneva. The embattled cartoonist discusses his ongoing court case and the shrinking space for cartoonists and journalists. 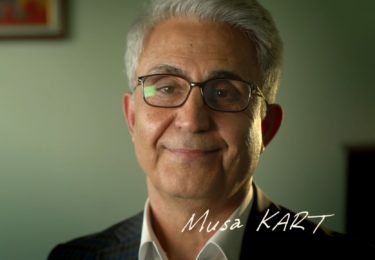 The oft-repeated statement “an attack on one of us is an attack on all of us” applies to political cartoonists worldwide after Turkish cartoonist Musa Kart was sentenced to prison. Why should Americans care about the fate of a satirist who mocked his president in a country half way around the world? Because it can happen here. It wasn’t that long ago Turkey was a beacon of democracy with a relatively freewheeling press. In a part of the world known for strongmen and monarchies, Turkish institutions were working hard to liberalize and guarantee individual freedoms, such as freedom of speech and freedom of the press. But with the ascension of Recep Tayyip Erdogan, all that changed. Erdogan used an attempt to oust him for his autocratic tendencies as an excuse to crack down on his opponents. Thousands were fired from universities, tens of thousands from government positions, and 50,000 were arrested, including his critics in the media. One of those arrested on trumped-up charges was Musa Kart, whose cartoons depicting Erdogan as a corrupt strongman surely irritated the Turkish president, whose base of support comes from the country’s religious conservatives—a group not known for being friendly to humor or a free press. In a travesty of a trial, Kart — along with 13 fellow journalists and staff members of his newspaper — was found guilty of “aiding terrorist organizations” and sentenced to almost four years in prison. Last week the Geneva-based foundation Cartooning for Peace gave Kart its International Editorial Cartoons Prize. 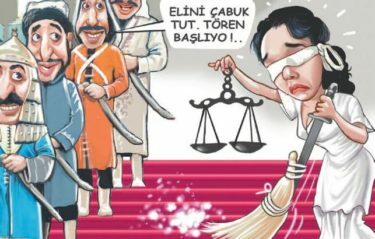 “The jury has chosen Musa Kart, iconic cartoonist of the Istanbul newspaper Cumhuriyet, for his talent and courage in defense of freedom of expression,” a statement from the group said. While we’re sure Mr. Kart was honored, he could not accept the award in person because the Turkish government has banned him from traveling abroad. In normal times it would be unthinkable that American journalists and satirists would fear for their freedom. These are not normal times. The current occupant of the White House has repeatedly attacked the press, even reviving the Stalinist phrase “enemy of the people” to describe us, all while encouraging violence against his opponents. It’s no longer unthinkable that one who irritates the leading political figure in America won’t be made to pay a price. The dark path Turkey has taken is one that we in the United States must guard against. 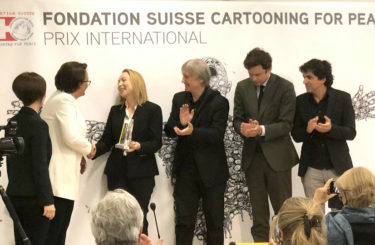 Musa Kart, Turkish cartoonist facing prison for trumped-up charges of aiding terrorist organizations, was the recipient of this year’s International Press Drawing Award given out by the Geneva based Swiss Foundation on Cartooning for Peace. Kart is not allowed freedom of travel while he appeals the prison sentence. He recorded the following video message thanking the free speech community and cartoonists around the world for the support they’ve given him. At left, wife and daughter of Musa Kart accept his award from the Geneva Foundation of Cartooning for Peace. GENEVA (Reuters) – A Turkish caricaturist facing more than three years in jail won the International Press Drawing Prize on Thursday, an award given every two years to leading cartoonists, especially those working under authoritarian regimes. 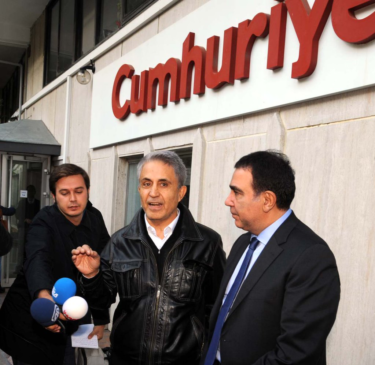 Musa Kart of the opposition newspaper Cumhuriyet was one of 14 staff handed sentences last month ranging from 2 1/2 to 7 1/2 years on charges of supporting Fethullah Gulen, the U.S.-based Muslim cleric that Ankara blames for a 2016 attempted coup. They have denied the charges. Kart, 64, was sentenced to three years and nine months and is banned from travel pending his appeal. After the coup attempt, he spent nine months in prison. “My beloved newspaper is currently surrounded by those who are uncomfortable with its journalism and want to silence it completely by threatening heavy punishments,” Kart said in a message read out by his daughter, Seran Uney, to a ceremony in Geneva on Thursday, marking World Press Freedom Day. The staff of the Istanbul newspaper, long seen as a thorn in the side of President Tayyip Erdogan, is one of the few remaining voices critical of the government.